Most sources agree that copper was the first metal to be used by primitive man, sometime around 8,000 B.C. likely because copper is found in its native state and does not need another alloy to make it workable. It is easily hammered and formed. Native Americans had copper tools when Europeans arrived. Copper does conduct heat and electricity well. Its properties of heat conductivity make it the ideal material for domestic use. 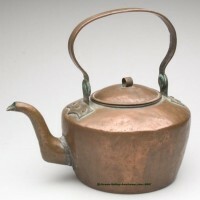 Most antique copper items were made for utilitarian use, primarily kitchen ware. 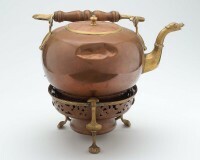 Through the middle ages, copper was used as hearth-ware. 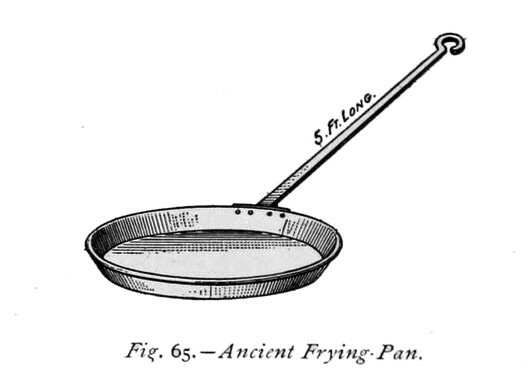 As such, the handles were very long on pans and skillets. Large vats used for boiling water could be turned upside down to form an oven. Copper wort pans were used to make beer. 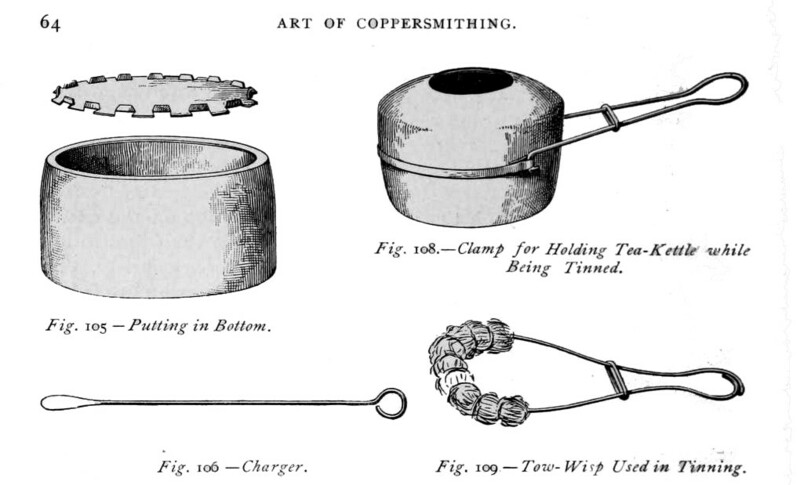 When the English first came to America, they brought their copper items with them. Additionally, colonists were forbidden to manufacture anything, so nearly all of the antique American copper will date from the 18th century forward. It was customary to repair copper utensils and cookware rather than acquire new ones. Coppersmiths were called Brassiers. “Early American Brass and Copper, and its makers” details approximately 140 American coppersmiths working from 1740 to 1863. 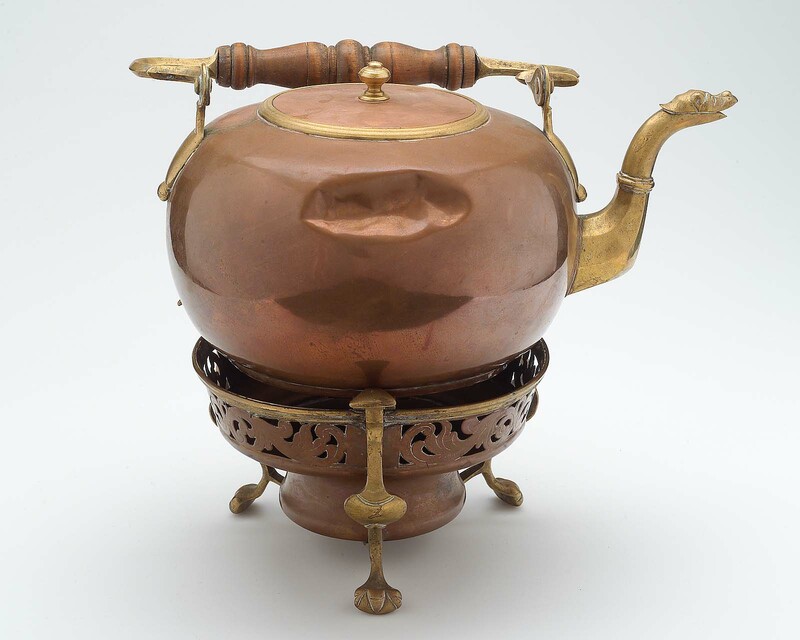 With few changes in the manor of manufacture until World War II, it is difficult to accurately date antique copper, but there are a few clues that collectors find helpful. While most teakettles can be purchased for modest prices, early American examples can be quite valuable as evidenced by this teakettle signed by John Richardson. It sold at Green-Valley Auctions, VA in 2007 for $4,250.00. Cooking with copper can cause copper poisoning, so antique copper utensils will always be tinned. This is a process where a block of sal ammoniac is melted to coat the cooking area. 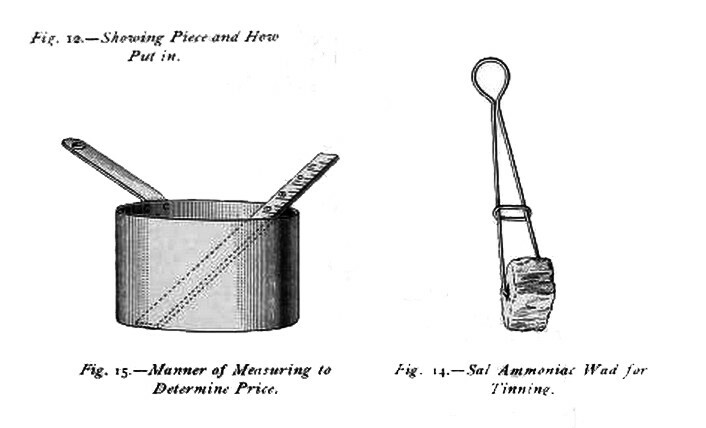 If your utilitarian ware does not show evidence of tinning, it is a reproduction. Tinning was not permanent. Items had to be re-tinned, so look for some evidence of tinning, however slight. Antique copper was functional; there should be evidence of wear in appropriate areas such as worn feet and hinge areas. Wear patterns will be irregular. While handles were functional, coppersmiths were master tradesmen who took pride in their work so handles will be finished, not chopped off. Pans will usually have a hole in the handle so they could be hung up. Items like ladles with iron handles will at least curve over so they could be hung up. The handles will suit the function of the piece. If you have a very large pot with very tiny handles, it is probably a reproduction. The highly decorative ladle below sold at Pook & Pook Auctions, Pa for $1,750.00 in 2014. Pennsylvania ladle, dated 1830, courtesy of Pook & Pook. Look next at the area where the handle is joined to the pot or pan. There will be a decorative element to the rivet plate, like a cartouche, spade-shape or double circles. Also, the rivets will be irregular in shape. Hollow rivets were not introduced until the late 19th century. Look next at the area where the handle is joined to the pot or pan. There will be a decorative element to the rivet plate, like a cartouche as shown in the John Richardson example above. They could also be spade-shape, double circles, or other decorative shapes. Also, the rivets will be solid and irregular in shape. Hollow rivets were not introduced until the late 19th century. While some antique examples exist, utilitarian copper vessels with lion’s heads and paws are usually reproductions. Reproduction copper is thinner and sometimes not even copper. It could be plated iron, so try using a magnet. Reproduction copper does not usually make use of the cramped joint. When it does, the solder is sloppy and not well planished. While wood handles were used in the 19th century, those cute copper pots and teapots with blue and white Delft handles were all made after World War II.